Draw circuit schematics in xcircuit. Extract a netlist for pcb. Create the layout in pcb, using the netlist to verify connections. Print the design with a laser printer onto toner transfer paper (Techniks Press and Peel). 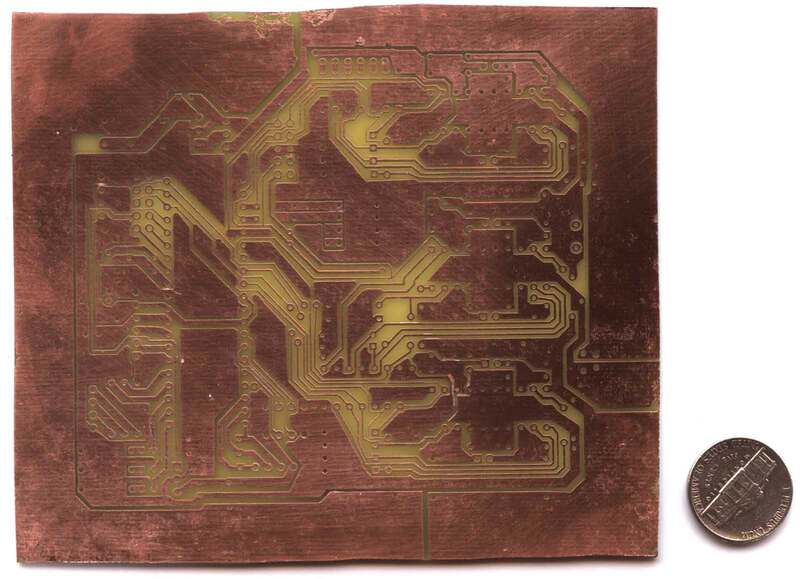 Transfer the pattern onto a copper clad board using an iron. Etch the board in ferric chloride. Since the Techniks paper hasn't arrived in the mail yet, I have been testing the process with HP photo quality inkjet paper. The results are not super consistent. Hopefully the Techniks paper will work better, since it is actually designed to be used like this! Here is a picture of the first decent-sized board that I made using the toner transfer process (HP photo quality paper). It is 5 inches by 4.25 inches. In the huge closeup, you can see a few places where the traces touched each other when they were not supposed to. I cut through these parts with a hobby knife so that they did not connect anymore. 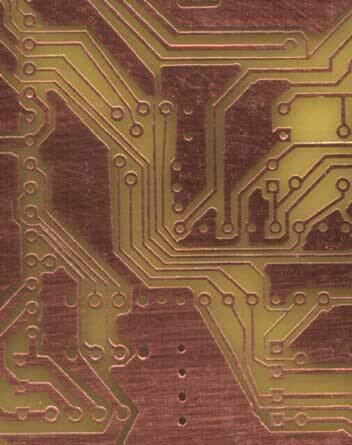 Also, there are places near the edges of the board where the toner flaked off, so the copper was etched away. DynaArt makes "Toner Transfer System" paper. Techniks, who produces Press and Peel paper (same idea, less expensive). Toner Transfer Instructions by Henry Carl Ott. This is an 8 page PDF file full of hints for using toner transfer to make PCBs. Very useful!